We give it a shot to cherish your moment, IEEE Student Branch NSS College of Engineering is laying foundation of the most anticipated first edition of AKIASSC’19. Conjugate and collaborate with us at NSS College of Engineering campus from 8th to 10th of February 2019. The core aim of conducting AKIASSC19 is to foster technological innovation and excellence for the benefit of humanity. By conducting different workshops and meetings with industrial experts, the students can increase their knowledge and technical skills. AKIASSC19 is the best place to show their talents and to develop their technical skills. The 3-day event top up with technical knowledge, managerial activities and an immense platform for networking. The most anticipated first edition of AKIASSC will support professionals engaged in the industries & research institutes of electrical and electronic engineering become a leading provider of scientific and engineering information on industry and its application. The event also provides professional development source for the students. The Industry Applications Society, as a transnational organization, is interested in advancement of the theory and practice of electrical and electronic engineering in the development, design, manufacture and application of electrical systems, apparatus, devices, health, and safety issues; creation of voluntary engineering standards and recommended practices; and the professional development of its membership. 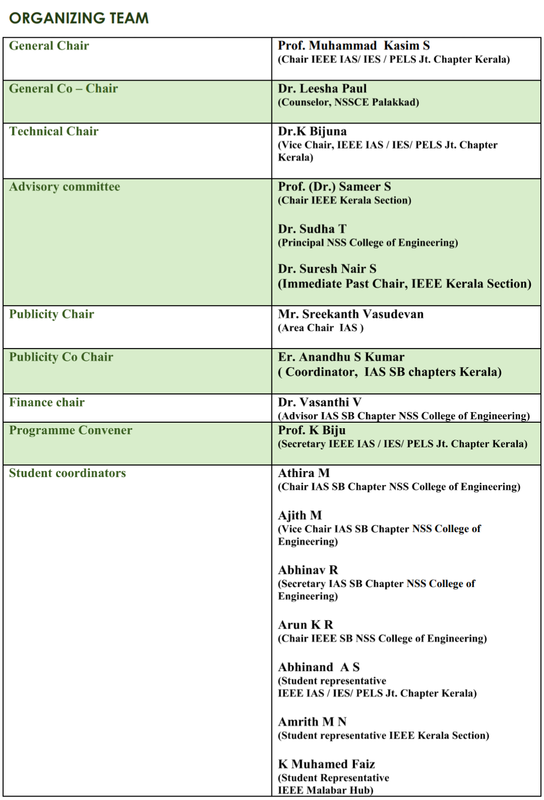 All Kerala Industrial Applications Society Student Conclave 2019 gives the IAS Student members a golden opportunity to network with a number of IEEE Senior members & experts in the Industrial field, to be mentored by them in their field of interest and explore internship through personal contacts. It helps to take volunteer and leadership roles in the chapter activities, avail travel opportunities and improve their communication skills and confidence levels. The IA/IE/PELS Jt. Chapter Kerala is organizing the first All Kerala IAS Student members meet (AKIASSC 2019) in February 2019 to showcase the benefits of being an IAS student member. Encouraged by the response and success of similar events organised by Computer Society Chapter Kerala, Power & Energy Society Chapter Kerala, IA/IE/PELS Jt. Chapter joint hands with NSS College of Engineering, Palakkad, Kerala for this prestigious event.Thus AKIASSC’19 provides a platform for the students to interact with Young Professionals, WiE Professionals, Seniors & industry experts. The IEEE Industry Applications Society, as a transnational organization, is interested in advancement of the theory and practice of electrical and electronic engineering in the development, design, manufacture and application of electrical systems, apparatus, devices, health, and safety issues; creation of voluntary engineering standards and recommended practices; and the professional development of its membership. It will be an iconic event to be conducted along with AKIASSC’19. It helps IAS WiE student members and professionals to expand the development of female students in technical innovations. 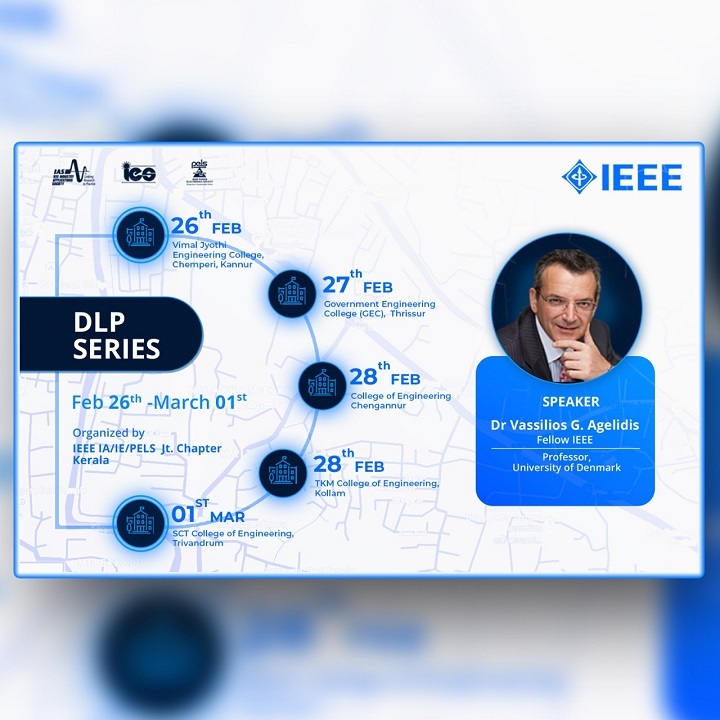 The event is scheduled as a parallel session on the 3rd day of AKIASSC’19(Feb 10th). IAS SBC Chairs and Advisers meet will provide the best platform to present the annual report of 2018 and the annual plan of 2019. This will be a great opportunity to celebrate the 10 anniversary of IA/IE/PELS Jt. Chapter Kerala. We welcome you all to have a soft spot for the 3 days event top up with technical knowledge, managerial activities and an immense platform for networking. Ignite the spark and unite with us in our endeavour. Standstill harmonized.